Click on the icons to take you to the respective websites. 1. Ever looked for a flight on Expedia or Orbitz but had to check Southwest or other “discount airlines” separately? No more. SkyScanner.com will check them all for you. 2. Wondering if the rent you’re paying/contemplating is fair in your area? Rentometer.com tells you if it’s out of line or not. BillShrink.com takes 3-4 minutes to profile what you need and then shops for your best contract. FindaBetterBank.com will compare account offerings based on your profile. 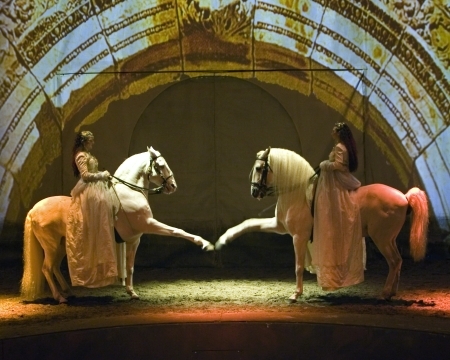 Cavalia is in San Francisco right now, returning to Los Angeles mid-January. You don’t even have to love horses to love this show. If you haven’t seen it, book it. If you have seen it, I’ll bet you’re booking again. I went today for my third time in five years. It is exciting and ethereal and much like witnessing a fairy tale unfold. Who DOESN’T love a good massage? Saw this awhile back, but it’s always enjoyable. Finally a little cosmetics-issue love from mainstream media! I’ve kinda been feeling like I’m sitting in the corner talking to myself and people maybe think I’m a bit crazed, but now the message about chemicals in cosmetics is disseminating a bit more widely. Hopefully consumers and manufacturers will start to listen. If you’re still in a quandary over the Send/No Send on Holiday Cards, this may just tip the scale for you. Although there are loads of online stationery companies to choose from, TinyPrints.com is my favorite. Not only do they have a HUGE range of designs in cards, invitations and announcements, but they offer great personalized gifts with flair. On top of that, I received some INCREDIBLE customer service from these guys. As for going green… and you know I like to try whenever possible, I say this is an exception. Let’s reduce the impersonal, pointless and needless use of paper and keep holiday greeting cards. Plus, Tiny Prints prints their cards on 30% post consumer recycled paper. Admit it… we all love seeing holiday greetings brighten our mailbox…. the rest of the year all we get is bills, ads and catalogs. Family not together for a photo? Go with a collage design. AND, they’re having holiday specials right now. Do you need any more reasons? Just DO it. If you know a cool auto/tech geek… or really anyone who needs to store digital libraries of movies, photos, or music, back up hard drives, or move files, pictures, documents, etc. from one computer to another, why not park one of these under the tree? Word Tease from Playwithyourmind.com… find two words within each nonsense string of letters. The order of the letters must stay left to right, and letters may only be used once. Example: PBALCAKY yields PLAY and BACK. The TSA is just such an easy target…. I will sing and dance with you.